| Photo Gallery | Join Us! You can also call about bounce houses for sale! 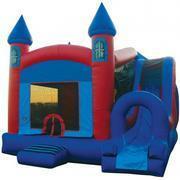 Bounce House Rentals...Rent a bounce castle with no hassle! Call or book online to reserve your date today! Bounce house rentals are taking the world by storm. People often don't know what to call them though: bounce house, moonwalks, jumpers, bouncers or even a kids party inflatable thing. We call them fun, and we have a great selection. We also have tables and canopies to help with your party needs. So whatever you want to call them...give us a call or reserve on-line and we promise a great time! "Look for the Sticker" - We are the first rental company in Parker County to be in full compliance with Texas State Law. Texas State Law requires that all airflow inflatables be insured and inspected, according to Occupations Code, Chapter 2151 and the administrative rules of Title 28 Texas Administrative Code, Section 5.9001-5.9014. All of our inflatables are in full compliance with Texas State Law. Before you consider renting from any company, be sure to look for the Texas Amusement Ride Compliance Sticker. 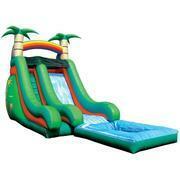 With AirHeads Party Rentals, safety comes first!